Andrew notes a certain fascination among some people with the London Underground. For me, it’s the concept of an entire network of railway services where you don’t need a timetable. You just turn up and go. The result is people treating the trains as the default way of getting around for a lot more trips than you see here. This raises an obvious question. Why can’t Melbourne’s trains run like the London Underground? Every so often people will ask why Melbourne’s trains can’t run like the London Underground, or the Paris Metro. Jon Faine put a similar point to Minister Kosky a few weeks ago, and it didn’t seem like she answered it very well. I think what both the Commenter and Faine meant is why can’t you have every train line running (at least in peak hour) a train every few minutes? The short answer is you could. With some caveats. But you’d need to make some changes to the way the trains work, so they were more like… well, the London Underground. Recently there’s been speculation on some of this about my line, the Frankston line, with the Herald Sun and the local paper noting “secret” plans to take the line out of the loop. This is actually no secret; it’s seen on one of the Victorian Transport Plan diagrams. So, let’s compare the Frankston line with the London Underground’s Victoria line. And I apologise for the amount of detail I’ll have to get into. The executive summary? Train lines work at their most efficient (maximum number of trains running) when there are no junctions, no shared track, no variations in stopping patterns. The moment trains share tracks, they have to be very punctual (almost impossibly so) otherwise at peak hours, one little delay has a flow-on effect. Melbourne: This is a big problem with the city loop. There are four loop tunnels, but fifteen lines, and most of them share those four. So for instance a delay on a Dandenong train means a Frankston train has to wait, delaying the following Dandenong train… you get the picture. It also limits the number of trains that can be added into the schedule, since the shared track has a limited capacity (about 20 to 24 trains per hour). This is why there seems to be a long-term plan to cut Frankston line trains, for instance, out of the loop. Reduce the shared track. London: To compare, the Victoria line is two tracks from Walthamstow Central via central London to Brixton. No shared tracks at all. Get rid of them, or if you can’t get rid of them, add grade-separation where possible so trains conflict with each other less. If you can do neither of those, you certainly make sure junctions aren’t used anywhere near the busiest part of the network, eg the city centre. Melbourne: What does this mean? Well, once you’ve got your tracks worked out, don’t bugger them up by having trains switch back and forth. So for instance for maximum throughput, you don’t want to switch half the Frankston trains to run through the loop and half not, and the same with the Dandenong trains, because that gets you back to square one — where one line interferes with each other and delays compound. London: The Victoria line has no junctions except at the ends of the line, and into the depot. Express trains save about a minute per stop skipped. So they go faster. This means they need more track capacity otherwise they’ll catch up with the trains in front. If a train line has a mix of stopping patterns, you waste a lot of that track capacity. So to standardise is the best bet. Obviously this has evolved with tweaks and fiddling over the years. And there’s a third track between Moorabbin and Caulfield which helps with some expresses. But it’s still hopelessly inefficient, as well as confusing to passengers. London: The Victoria line has only one stopping pattern: all stations. 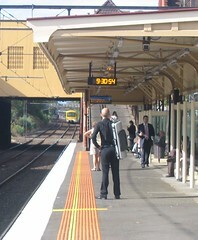 As a result, trains run every two minutes in the peak hour, so they maximise the use of the track. It also means nobody ever gets caught on a train that’s not stopping at their station (well, unless it’s terminating early, or they’re on the wrong line!). Remember though the Frankston line is about an hour long to the city. So some expresses for long distance passengers are clearly desirable. 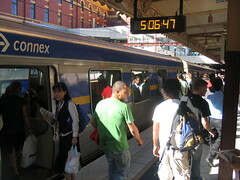 Melbourne: As with all of Melbourne’s train lines, trains terminate at Flinders Street, and drivers change there. Because this is smack in the middle of the city, and is the busiest single railway station on the network (in terms of numbers of passengers), this leads to delays. London: The Victoria line (and the other Underground lines) runs through Central London, but has no terminus station there. The trains just go right through, with no driver change-over. So in Melbourne, if you do that, obviously trains through the loop can just keep going back out to the burbs. For trains that don’t run the loop (as is flagged for the Frankston line), you could hook it up to another line on the other side of town, and run trains through that way. So how would you run the Frankston line for maximum efficiency? Let’s assume that because the Dandenong line is busier, and for many people coming in from Pakenham and Cranbourne a longer trip, that it gets use of the Caulfield loop, and it runs express from Caulfield to South Yarra. So Frankston trains would run direct from Richmond to Flinders Street. You’d want to improve interchange facilities to/from loop trains at Richmond (if possible re-arrange things so that cross-platform changes can be made, as on platforms 7+8), and encourage people on Dandenong loop trains to switch to direct trains if they were heading to Flinders Street, to even-out the train loads. Frankston trains would standardise and stop all stations from Caulfield to South Yarra. But in peak times you could use the third track to run trains from Frankston express from Moorabbin to Caulfield and have others originating at Moorabbin, to spread the load and give the people from beyond zone 1 a quicker ride. So the only junction in use would be at Caulfield. You wouldn’t terminate the trains at Flinders Street, but through-route them to one of the north/west lines. Obviously as Werribee/Williamstown is also direct into Flinders Street, that might be the one to hook up. Now, our signalling can’t really cope with trains every two minutes, but three minutes should work right now, with future upgrades possible. So (without me thinking properly through the implications at the western end) you’d have trains every 6 minutes at each station along the Frankston line, and every 3 or so minutes from Caulfield into the city and out to Newport (tweak it a bit to fit a few Geelong V/Line trains in there somewhere). Important: Run them all day every day at least every 10 minutes so people never have to look at timetables (maybe drop the expresses at quiet times), call it the Bayside Metro, get the minister to cut the ribbon, and away you go. At the cost to some passengers of having to change trains for the loop, and a bit less express running, waiting times would be slashed, there’d be consistency and simplicity, and reliability should increase, and with that patronage. And you’d provide a direct link from Caulfield to Footscray without having to build a multi-billion dollar tunnel. And it’s more trains than the line currently gets, so crowding should reduce. Something similar could be done on every other line to maximise the number of trains running. Then yes, Melbourne’s rail network would be more like the London Underground. Why is it that there is someone with a wealth of knowledge and a vested interest (you), but no power to make those changes, and guaranteed those who are in charge with improving the system probably don’t use public transport, nor have the interest or knowledge to say what needs to be done. Or else it’s just like everything else, it’s not profitable so why bother. Sounds ok, and without a huge capital outlay. Some outlay should go towards improving the facilities and information for the Richmond change over from direct to City Loop and vice versa. Might be just cheaper and give a better result to just start again with Richmond Station. I have used both the London and New York subway systems for travel when overseas and even being unfamiliar with how the ticketing worked, and which train to catch and stop to get off (my maps were well and truly creased from overuse!) they were vastly superior to the Vic system which I have grown up with and used since I was a kid. I cannot recall ever having to wait more then 2-3 minutes for any train which I caught in London or NY and there was no overcrowding during peak hour. I’ve always felt the downtime at Flinders Street was one of the most annoying things about our network. It just make sense that a train that arrives at Flinders Street shouldn’t ever reverse back out the way it came (my morning train which usually originates at Alamein or Blackburn always do this, with the effect of holding us up regularly in the Flinders Street Railyards). It doesn’t matter if the loop is involved… as long as a train doesn’t sit at Flinders Street for more than a minute. Dammit, man! Such lofty plans cost money! Don’t you know we have Ferris Wheels to build? Even if the trains ran every 5 minutes it would be a huge improvement on what we have now. @Stitch Sista: They might not see it as profitable, but I think it would be. If trains are more reliable, then it’s more likely that more people will use the train network. Sure, it’s long-term, but increased patronage means more money, doesn’t it? How many level crossings would they have to replace along the line, and at what cost? I’m only asking because I have no idea. Trains every six to ten minutes (in both directions) would have the crossings effectively constantly closed? The BIG difference about the underground is that, well, it’s UndergrounD and doesn’t interfere with other things! Fair point Flerdle. At times on the Frankston line now, there is a train on each track about every 8-10 mins, eg 3 trains every 10 minutes. Go to much more than that and some level crossings would have problems, especially spots like Glen Huntly where trains are reduced to 20km/h because of the tram tracks. Though I suspect in most spots they’d manage, and there’s certainly nothing stopping upgrading off-peak frequencies. Jordyn: My thoughts are that a good public transport system is never going to be profitable – hence why it shouldn’t be privately operated in any case. I consider it an essential service just like hospitals and utilities…However if we the taxpayers become the shareholders, then we profit by virtue of having a good, useable transit system. Ideally we’d abolish cars, have a super duper public transit system that was free or charged only token amounts. I wonder how far the $$ from propping up the car industry and subsidising roads would go to creating this system. True, Daniel; really I meant grade-separated. And yes, off-peak frequencies need a big boost (everywhere). You think Melbourne is bad? Come and check out Sydney – public transport is in a shocking state here. It takes me 50 mins to get to work each day by public transport, and yet I live in the inner city and need to travel only 10kms! I consider how incredible the London and European networks are and wonder how can Australia be so far behind? We have so much distance to cover in each city, if public transport is not available, a car is the only option. I think most people would be happy to leave the car at home, however the state of public transport just doesn’t allow for this! The shared track issue is present between North Melbourne and Sunshine where you have an undesirable mixture of V/Line trains to Ballarat and Bendigo and surburban trains to Sydenham (soon to Sunbury I guess). Assuming electrification is done to Melton at some stage (overdue probably as it is fast becomming a suburb) is there a plan to deal with this? From what I’ve seen the proposed Tarneit Line brings Geelong trains via this line too. Is the proposal to run them in on the suburban tracks, or through the dual gauge tunnel, assuming some connection is done at Sunshine? Furthermore most plans for a line to Rowville connect to the Dandenong line at Huntingdale (thus servicing places like Monash Uni) . As I live not far from this line, I support it strongly as it is a PT black hole at the moment. However is there a plan to cope with dumping around 30% more traffic on the line from Huntingdale? As a regular commuter on the Dandenong line, things turn to crap on occasion as it is, with the South Yarra-Caulfield-Oakleigh catching up with the stopper in front of it. (In addition to incidents on level crossings, passengers waiting for ambulances that never come, and an incident where two passengers fought and one pressed the emegency button at Westall). Also usually see the V/line from Traralgon inching its way behind a suburban in the other direction. I have also noticed a similar problem with the Geelong service – recently I took the train to Geelong and back on a Sunday – all smooth sailing until the Altona Junction. We pulled up at the old Paisley station then inched in behind a suburban train for the remainder of the trip. The Tarneit line would include an extra pair of tracks from Sunshine into the city, to take V/Line trains from Geelong, Ballarat and Bendigo. I think the Tarneit line concept itself is troublesome – it would try and make Geelong trains run an outer-suburban service too – but the dedicated V/Line tracks idea has some merit. Mind you, as Paul Mees has pointed out, there’s already a set of tracks under Footscray; why aren’t these used? The Dandy line will get a revamp when the Westall project is finished. Expect to see express trains from further out, and shorter-distance trains starting at Westall, travelling in their wake. But note Westall is not much further out than Huntingdale; if you can do a two-tier service from Westall, why not from Huntingdale using Rowville trains? My tuppence is about comparing Melbourne’s rail network with the Underground and the Metro. The Metro only covers a small area and should be compared to our tram networj and not our rail network. Both systems cater for cities with populations significantly larger than ours. I do agree with Daniel’s solution (in theory) but just get ansty when people compare apples with oranges. Because there is no line to Rowville, Daniel. There’s no justification for one to be built either, although Monash Uni would come in the “it would be nice” basket.